Taktshang Goemba which is popularly known as the Tiger’s Nest Monastery is the most impressive building in the world for me. 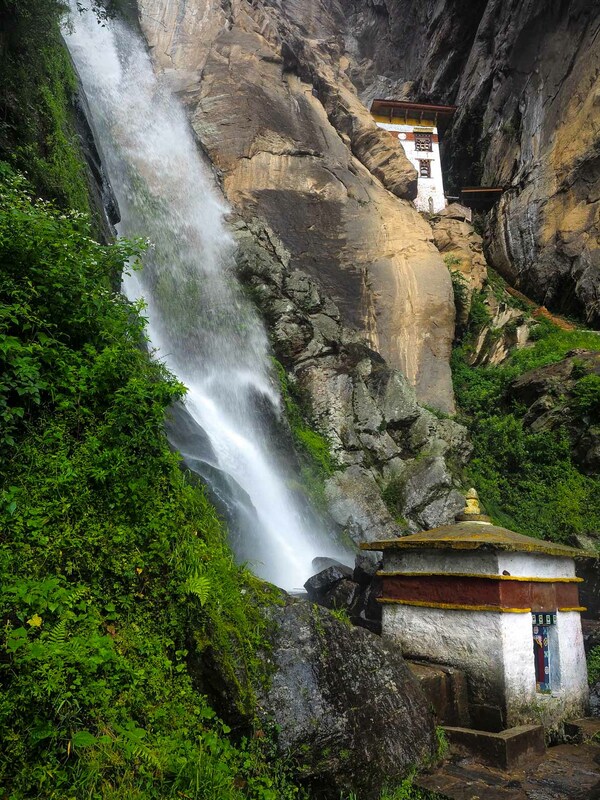 It is also high on many people’s bucket list and often the reason why travellers visit Bhutan. 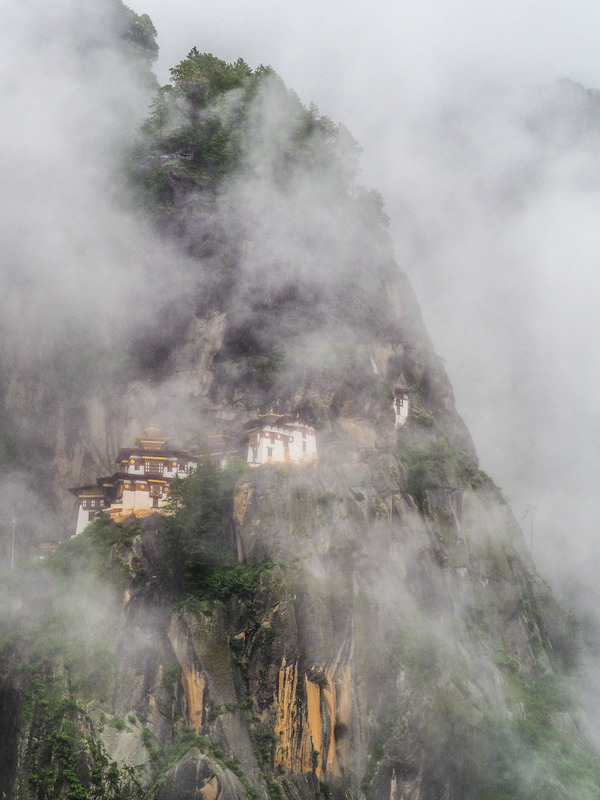 The Tiger`s Nest Monastery is said to be the spot where Guru Padmasambhava (also known as Guru Rinpoche) landed – when he flew from Tibet on the back of his Tigress. That´s why the name! 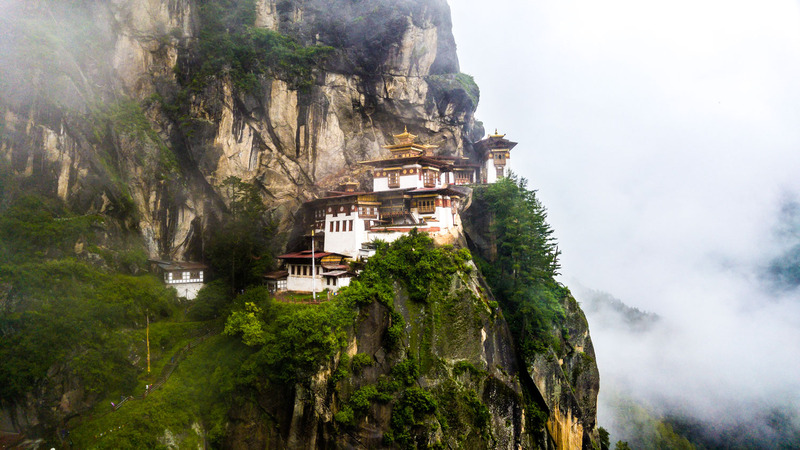 There was only a cave at the place he landed, the Taktsang Senge Samdup cave – where Guru Rinpoche stayed and meditated for 3 years, 3 months, 3 days and 3 hours in order to overpower the evil demons living inside the cave. 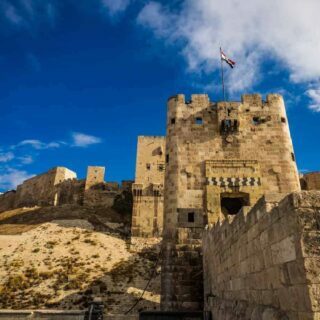 The first Monastery was built around 1692 around the cave but was unfortunately burned down on 19th April 1998 from, what is believed to be, an electrical short-circuiting or flickering butter lamp. It has been completely rebuilt to its current look after the devastating fire. The Tiger`s Nest Monastery is built on the edge of a high cliff 3120m/10,240ft above sea level and 900m/3000ft above the valley’s floor. 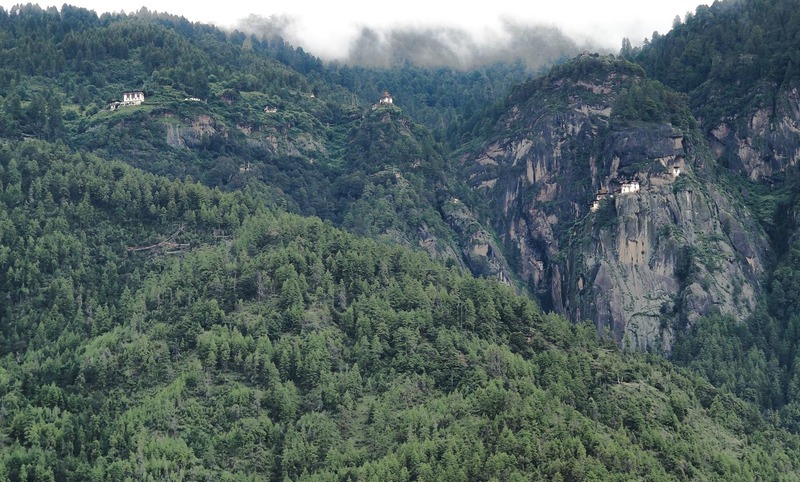 The Monastery is located only about 10km/6.2miles north of the city Paro. And despite its location high up in the mountainside, it is easily viewable from the road. The Tiger Nest up there to the right as seen from the road. But you need to get up close to see how magnificent this Monastery really is. 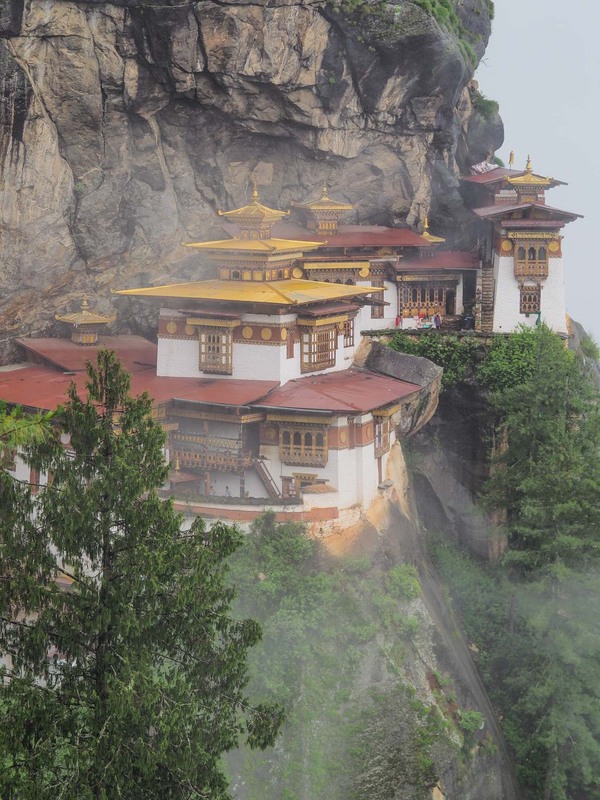 The Tiger`s Nest is the most visited sight in all of Bhutan, and with being popular means hoards of tourists. I and my guide left Paro at 6 AM in the morning to visit the Monastery before others arrived. That proved to be the best decision I have ever made during my travels. I was together with another traveller to be the first ones to reach the Monastery that day. When we left, there was a queue of a few hundred people waiting to enter. And while going back down we did pass at least another hundred tourists. So do yourself a favor and get out of bed early the day you are going to visit The Tiger`s Nest. 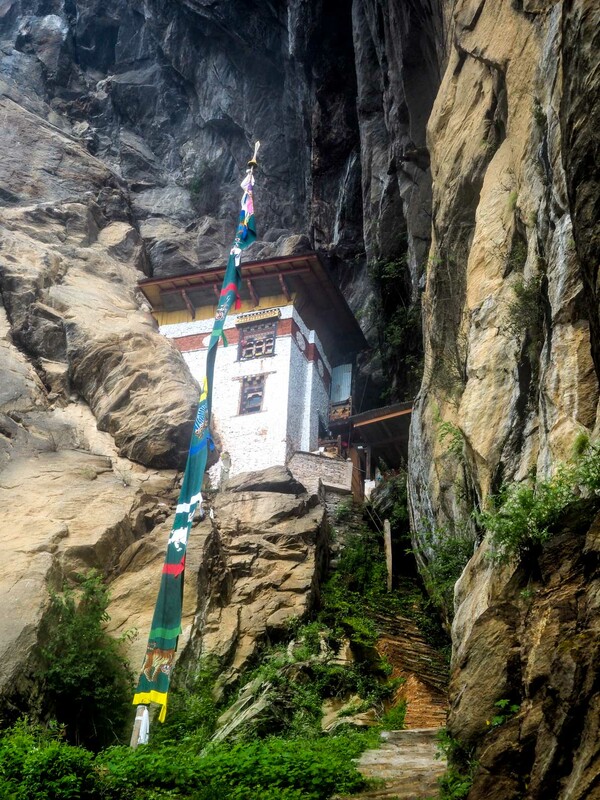 How to reach The Tiger’s Nest Monastery. Tourists will complain about the bad weather, a Traveler will find a reason to enjoy it. Here are the photos from the amazing trip not as good as I would have preferred. The only way to reach the Tiger Nest Monastery is by foot or on the back of a horse. It´s only a short 25min car ride from Paro to reach the parking lot where you will start your hike up to The Tiger`s Nest Monastery. 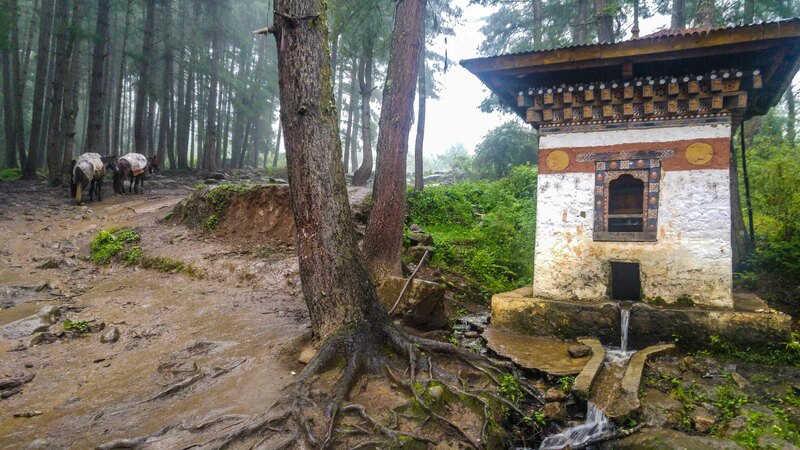 From the parking lot is the trail which climbs into a pine forest where you will pass by several Chorten´s buildings with water-powered prayer wheels inside. These buildings are surrounded by prayer flags. The parking loot where your hike will start from, the horses in the back if for rent. If it´s raining (like during my visit) the path will be extremely muddy and slippery in parts. I will highly recommend you to use walking sticks during rains. You can also hire a horse to carry you up. The path was very muddy and wet during my hike. Most people take around 2 hours to reach The Tiger`s Nest but if you are a quick walker, the hike will take around 50min. The small cafeteria on your way marks the halfway point. 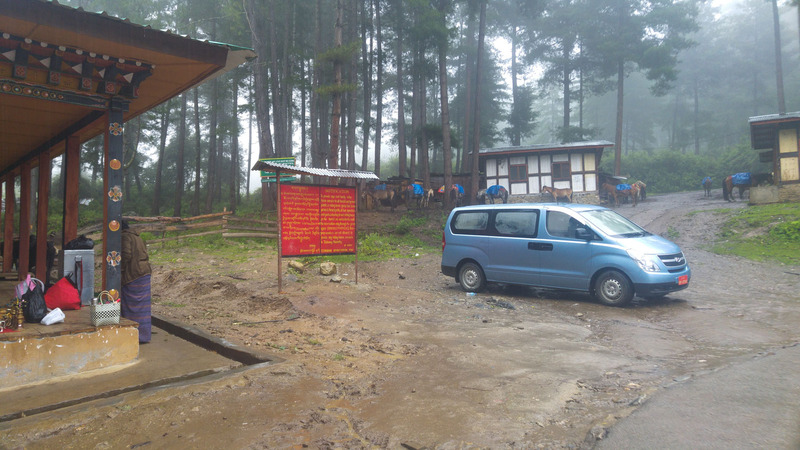 When I reached the cafeteria the weather was cloudy hence there was no way to spot The Tiger`s Nest. I decided to continue the hike with the hope that the weather would clear up when I reached the monastery. People having a rest at the cafeteria while enjoying the view Tiger Nest when I’m on my way back. This is also the first viewpoint of The Tiger Nest Monastery. Surprisingly, many tourists seemed happy about the view from the cafeteria and decided not to continue the hike all the way up to the Monastery. The cafeteria serves hot drinks, soda, beer and some basic dishes. It´s a great place to warm up if you’re unlucky with the weather. There are few well maintained and clean western toilets at the cafeteria as well. The path from the cafeteria is pretty steep and slippery; I almost slipped a few times. 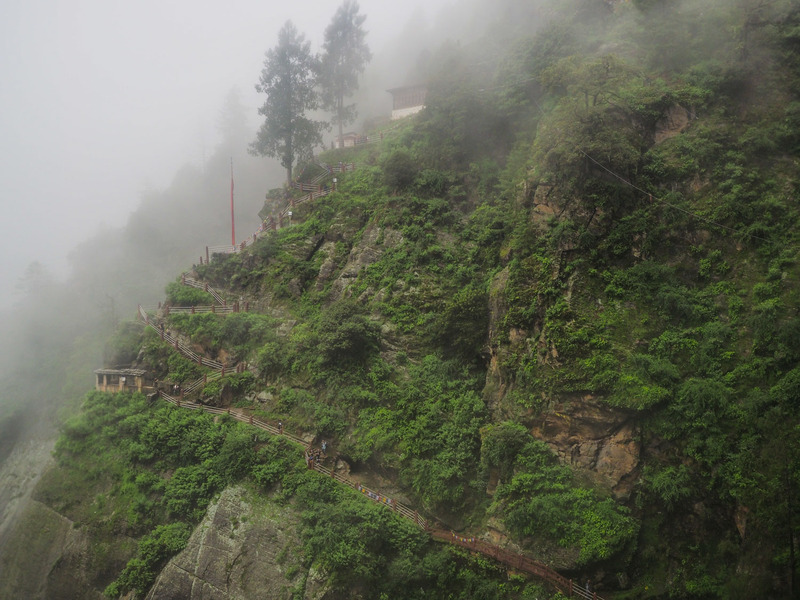 But when the weather cleared up, I enjoyed the stunning view of The Tiger’s Nest Monastery. The first view of The Tiger Nest, the clouds cleared up for a few minutes. Except for the first part from the cafeteria being steep and slippery, the rest of the way was easy and mostly flat. It shouldn’t take you more than 20 minutes from the cafeteria if you are a fast walker. You will pass a few small monastery´s on the way up, they have some residential monks living in them. It´s worth a stop if you got time. It´s getting closer! The view from the most famous viewpoint. After reaching the most famous viewpoint, you have to walk all the way down – up to 780 steps to reach The Tiger’s Nest itself. You will have to walk down from the highest point before going up again. Typical Himalayan terrain. You will cross a small bridge before the last climb up. The bridge is across a sacred pool with a large waterfall, which drops by 60 meters (200 ft) into the sacred pool underneath the bridge. The waterfall you have to walk past, notice the small building up in the right corner. It is the meditation house for monks. 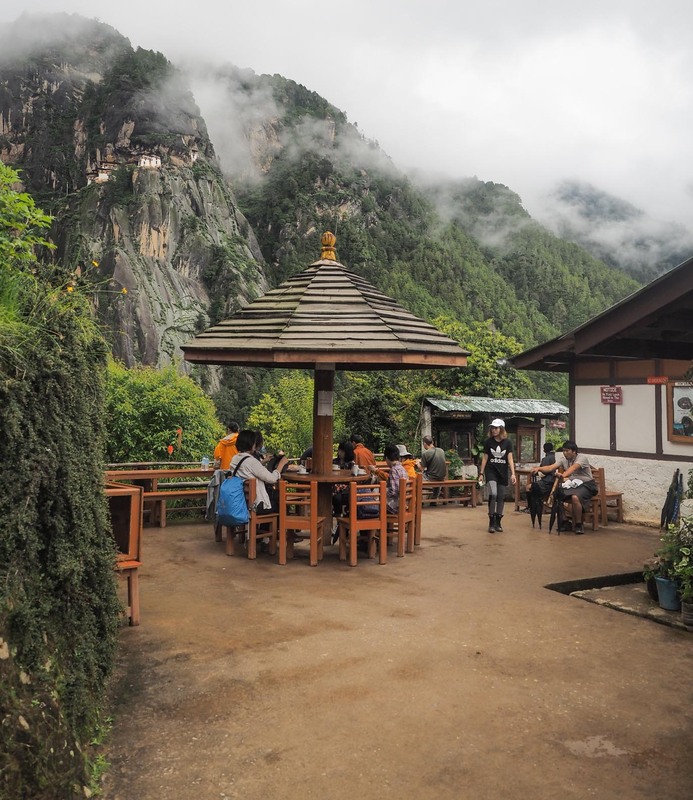 When you finally reach the entrance of The Tiger Nest Monastery, you will enter a small courtyard where you will have to leave your backpack, camera, and phone to the security room. There´s a strictly enforced rule of no photography inside the Monastery. Try to Google it – there are no photos from inside. You will need long pant´s to enter the Monastery. You will also have to remove your shoes when entering. Your guide will accompany you inside the Monastery and will tell you the history of the place. You will learn that the Tiger Nest Monastery has a few temples within the Monastery. These temples are built around 9 sacred caves. Some of the caves are used for meditations these days. The most sacred cave “Pel Phug Cave” where Guru Rinpoche meditated for more than three months is sealed off and only opens once a year. The atmosphere inside the Monastery is very relaxing and calm. Even someone like me who is not spiritual could feel that there’s something special about The Tiger Nest Monastery. Additional information about The Tiger Nest Monastery. October – March: 8AM – 13.00PM, and 14.00 . 17.00PM. April – September: 8AM – 13.00PM, and 14.00 . 18.00PM. The entrance fee is included in your tour package. Everyone except citizens of India, Bangladesh, and Maldives will need a guide to enter the Monastery, same rules as in rest of Bhutan. Bring a pair of pants in your backpack if you want to do the hike in shorts. You are not allowed to enter the Monastery in shorts. You can buy a wooden walking stick for 1USD at the parking lot. 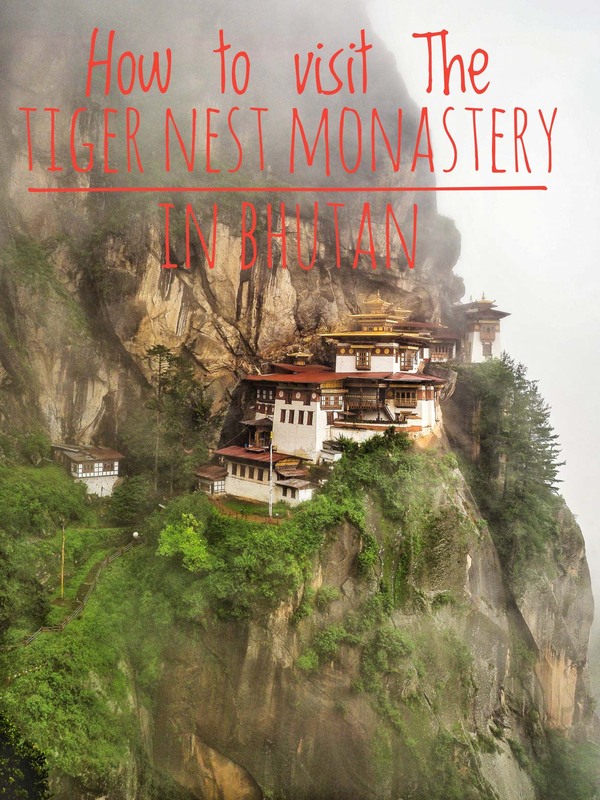 The locals in Bhutan will use the local name Taktshang Goemba instead of The Tiger’s Nest Monastery when having a conversation. There´s a no camera and Photography policy inside the Monastery, not even mobile phones. You will have to leave all your belongings at the security room before entering, (free lockers) but will have to use your own padlock. You will also be searched by a security guard before entering the Monastery. Looks like a great place to visit. I heard it was hard to get into Bhutan but it looks like it is worth it. I would love to visit there. These are some amazing photos and a great story to go with them as well. 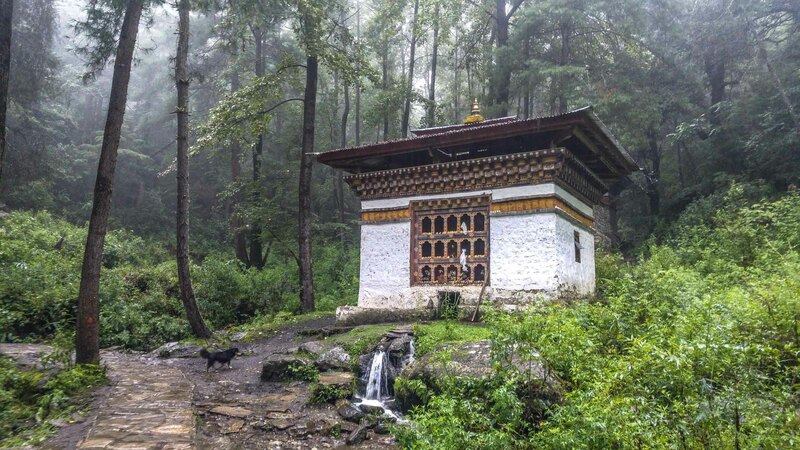 I was contemplating going to Bhutan, what would you suggest the best way to travel to it be, the obvious answer being by plane. Can I ask what you found difficult with the hike? I found it to be VERY easy, even with the rain. Hi. Thx for the sharing. I’m planning a trip to tiger nest in coming Aug…The information is very helpful..
And what kind of padlock should I bring along, a small padlock or a bigger padlock? A smaller padlock should be enough, just bring any you already have.